Ryan Bingham travels. His work sends him all over the country firing people for major corporations. He sees people at their absolute most vulnerable and can talk his way out of any situation. But then change starts happening around his structured life. He meets a woman and his job is in jeopardy. Where does a traveling man go when he's grounded? So I had been reading countless positive reviews and seeing this film near the top of every 10 best list this year and found myself continually asking "why?" Sure, it looked entertaining enough and Jason Reitman has proved he's a good director with Thank You For Smoking and Juno but this looked like a random movie. One of those "why is this a movie?" types. Never again will I doubt Reitman. Up In The Air is one of the best films of the year and lives up to everything you've heard. It's hard to address the why behind the genius because that would delve deep into spoiler territory and I don't want to do that. I suppose the best way to describe this film is to borrow a quote from The Big Lebowski. "Sometimes, there's a man." And in many ways, Ryan Bingham is The Dude of the 2000's. A Lebowski for the Mad Men generation. Clooney plays the part to perfection and if the role would have been played by anyone else, the film would have fallen short. The characters and the story are rich and complex and by the time the film ends the journey you've taken with them is amusing and tragic. The whole film is filled with contradictions this way, but instead of grating against each other they really work well and layer the film. Even visually the film is stunning. It bares a repeat viewing to just look at the background. So many important things happen in the background of the airport scenes that the film will be picked apart for years to come. 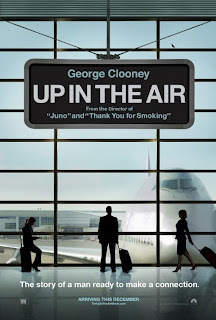 Up In The Air is about work, love, life, family, friends and being. Jason Reitman has crafted a masterpiece here and now has a lifelong fan. If he doesn't go home with a golden statue this year, I'm going to have a bone to pick with the Academy. i really want to see this movie because of your review. Idk when i'll get the chance though.